A suicide bomber targeted an open-air market in the southwestern Pakistani city of Quetta on Friday, killing at least 20 people and wounding dozens of others, police and hospital officials said. Shortly after the bombing, struck near a residential area, dozens of angry youths rallied in Quetta, demanding more security from the authorities and the arrest of those behind the attacks. They also denounced the violence by terrorists who have killed hundreds in similar attacks over the past years in Baluchistan province, where Quetta is the capital. "It seems people from the Hazara community were the target," said senior police chief Abdur Razzaq Cheema, adding that some of the victims were in critical condition. 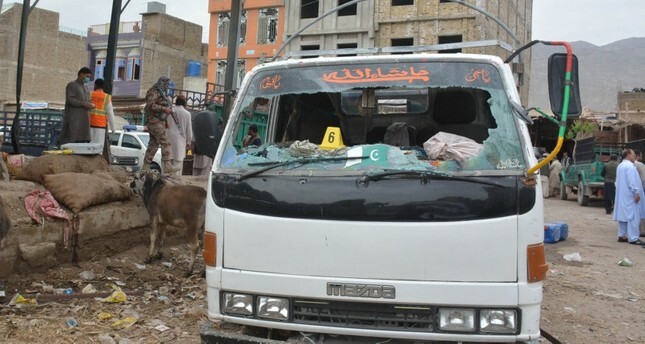 Mir Ziaullah Langau, the provincial home minister, said the suicide bomber had walked up to the marketplace and detonated the bomb. No group immediately claimed responsibility for the attack, which took place in the Hazarganji neighborhood. Cheema, the police chief said a paramilitary soldier was among the dead. Four paramilitary troops, who were guarding the open-air fruit and vegetable market, were among the wounded. Local TV footage showed several damaged shops and at least one paramilitary vehicle. A wounded man told reporters from his hospital bed how he had heard a loud explosion before he was struck down. Qadir Nayil, a leader of the Hazara community, asked the government to provide better protection. "Once again our people were the target and once again we will have to bury our dear ones," he said. "We demand more security from the government and all those involved in today's act of terrorism should be found and punished." Pakistani Prime Minister Imran Khan and President Arif Alvi issued statements condemning the attack and adding that it would not weaken "the resolve of the nation in the fight against terrorism." Jam Kamal Khan, the chief minister of Baluchistan province, also condemned the attack, saying "the enemy of humanity" is to blame. Hours after the attack in Quetta, a roadside bomb exploded outside a shop in the southwestern border town of Chama, killing one person and wounding 10 others, police and hospitals officials said. Several militant groups operate in Baluchistan, which is also the scene of a low-level insurgency by separatists demanding more autonomy and a greater share in the region's natural resources such as gas and oil.